I've been a fan of Play Music for a long time, though the device removal limit does get in the way when you switch between devices and ROMs as often as I do. Being able to mix your own library with those of a service also comes in handy. That way I can continue to support artists I am passionate about, without eschewing the larger selection of a subscription offering for the purposes of content discovery, all while being able to fill the gaps in that library. There are a lot of different music services out there, but if you're interested combining your curated library with music available via a subscription, then your options are limited. Spotify does allow you to play back locally stored files, which is convenient, but it isn't quite the same. Amazon also allows you to upload your music for playback via Amazon Music, and with Amazon Prime membership, you get a small library of streaming music to go along with that. For $10 a month ($8 for Prime members) you can access their full library as well. But, Google Play Music has a great interface and plugs nicely into all the other Google services we love. 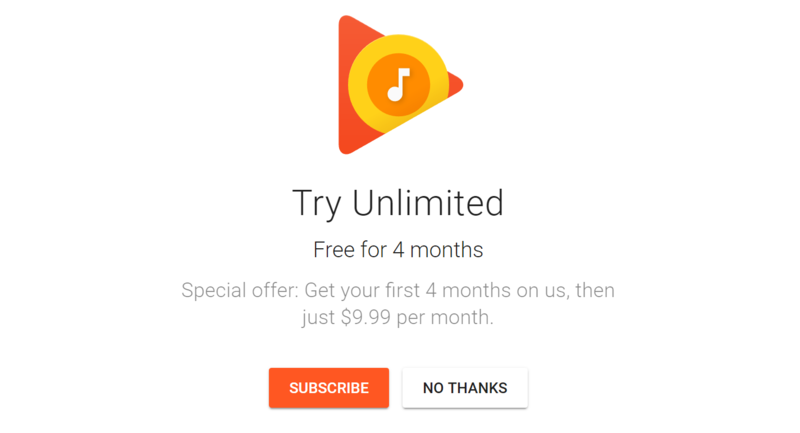 Maybe with this new offer, it's time you gave Google Play Music a chance? After all, even if it doesn't end up working out, you still got four free months of music out of the deal.